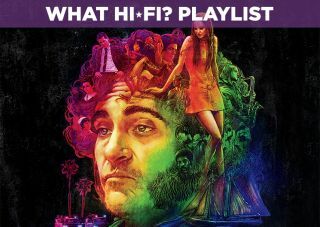 Inherent Vice Blu-ray review | What Hi-Fi? What is Inherent Vice about? A whole two hours and thirty-eight minutes later and we're still not entirely sure. Yes, there's a 'case' to be solved, but unless you've read Thomas Pynchon's novel of the same name you couldn't predict what comes next. Like Joaquin Phoenx's character, P.I. Larry 'Doc' Sportello, there's little point in trying to get to grips with it. Though it may sound clichéd, it's the journey that matters, not necessarily the destination. As most stories seem to, it starts with a girl – Shasta Fay Hayworth (Katherine Waterston). She walks into Doc's house with knowledge of a plot to kidnap married land developer Mickey Wolfman (Eric Roberts), who she happens to be having an affair with. She mysteriously disappears, as does Wolfman, leading Doc to put on his detective hat on and figure out what's going on. There's something about a boat moored off the Los Angeles coast (The Golden Fang), a syndicate of dentists, a biker gang and another missing person (Luke Owen's Coy Harlingen). It's likely that on first view you won't be able to make much sense of Inherent Vice's deliberately dense plot. It's better to just go with the flow and let it wash over you. The relaxed vibe goes hand-in-hand with the 70s era, and what would a film set in the 70s be without a healthy dose of paranoia? Nixon is name dropped, so too Governor Ronald Reagan and the Vietnam War, with LSD being the popular drug of choice. The Manson murders leave their mark on society too. Anderson etches an era where uncertainty and mistrust were rife. So who can you trust? Probably Phoenix's Larry 'Doc' Sportello. Phoenix's hapless P.I. – who may be one of the least competent in cinema – is a charming, shambling presence. His reaction shots in some scenes are priceless and despite his shaggy, unkempt appearance and lack of lucidity, he isn't as idiotic as everyone regards him to be. Well, at least when he's not completely stoned. He's assisted by the no-nonsense, hippie-hating Josh Brolin as Det. Christian F. 'Bigfoot' Bjorn. He takes issue with Doc but still offers help despite sending a boatload of verbal and physical abuse Doc's way. His 50's buzz-cut and strangely specific meanness makes him a fun watch too. But Brolin isn't a complete caricature. There's a hint of melancholy underneath the surface suggesting something more. There are plenty of other actors in small roles, including Benicio Del Toro, Martin Short and Reese Witherspoon and all add to the hazy atmosphere. Vice is blessed with a great sense of oddball humour, and at two-and-half hours it definitely needs it. It starts strange and gets progressively stranger. Shot in widescreen and on film by Anderson's regular DP Robert Elswit, Vice looks wonderful. The film's colour palette is full of vivid electric blues and soft, mellow oranges. Black levels are excellent throughout but it's the lovely contrast created by shadows that catches our eye. The film's opening scene has characters walking in and out of shadows and the effect is stunning. There's a healthy layer of film grain, and tones are a mix of tanned skin and ruddy complexions. Nothing out of the ordinary for a film set in California. There's plenty of detail - just have a look at Joaquin's Wolverine-esque mutton chops or his feet, which are so filthy they'll make you a little repulsed when they're in the frame. Like the film the DTS-HD Master Audio track is laidback. There's not much to get a system sweating apart from some gunshots (or a housemaid being amusingly rude when serving Doc). Dialogue is the priority here, and happily enough there are times where characters mumble but you can still make out the words. To our minds that's the sign of a strong track. Is Inherent Vice worth a watch? Whether you're an Anderson fan might factor, and undoubtedly the nature of its complicated plot is another reason you might give it a wide berth. And you'll need to clear your schedule for all 158 minutes of its languid style. But Anderson has made a distinctive effort that stands out in a year that's produced some thoroughly lukewarm films. It's idiosyncratic and uncompromising, a cross between 70s paranoia, David Lynch and The Big Lebowski. You might like it or feel completely bored by it all. We like it. Vice has a personality and love it or hate it, well, that's just your opinion, man.